The delegation kneels in prayer at Auschwitz. Following is a statement issued by the Muslim leaders who visited Auschwitz and Dachau last month. 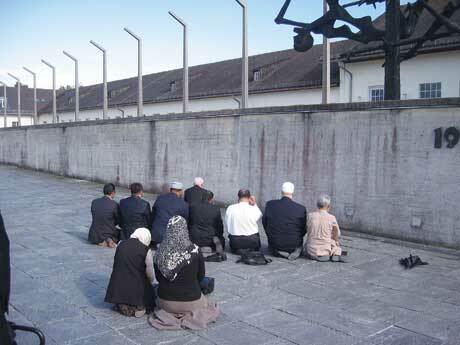 On Aug. 7-11, 2010, we the undersigned Muslim American faith and community leaders visited Dachau and Auschwitz concentration camps where we witnessed firsthand the historical injustice of the Holocaust. We met survivors who, several decades later, vividly and bravely shared their horrific experience of discrimination, suffering, and loss. We saw the many chilling places where men, women, and children were systematically and brutally murdered by the millions because of their faith, race, disability, and political affiliation. In Islam, the destruction of one innocent life is like the destruction of the whole of humanity and the saving of one life is like the saving of the whole of humanity (Holy Qu’ran, al-Ma’idah “the Tablespread” 5:32). While entire communities perished by the many millions, we know that righteous Muslims from Bosnia, Turkey, Tunisia, Morocco, and Albania saved many Jews from brutal repression, torture, and senseless destruction. We bear witness to the absolute horror and tragedy of the Holocaust where over 12 million human souls perished, including 6 million Jews. We stand united as Muslim-American faith and community leaders and recognize that we have a shared responsibility to continue to work together with leaders of all faiths and their communities to fight the dehumanization of all peoples based on their religion, race, or ethnicity. With the disturbing rise of anti-Semitism, Islamophobia, and other forms of hatred, [hate-filled] rhetoric, and bigotry, now more than ever, people of faith must stand together for truth. Together, we pledge to make real the commitment of “never again” and to stand united against injustice wherever it may be found in the world today. “¢Dr. Sayyid M. Syeed, National Director of the Islamic Society of North America’s Office of Interfaith & Community Services, Washington, D.C.
“¢Imam Suhaib Webb, Muslim Community Association, Santa Clara, Calif.
“¢Laila Muhammad, daughter of the late Imam W.D. Muhammad of Chicago, Ill.
“¢Sheik Yasir Qadhi, Dean of Academics for the Al Maghrib Institute, New Haven, Conn.
“¢Imam Syed Naqvi, Director of the Islamic Information Center in Washington, D.C.
“¢Imam Abdullah T. Antepli, Muslim Chaplain, Duke University, Durham, N.C.